Arusha is the hub town for northern circuit safaris. Arusha Reserve makes a pleasant day’s outing from here, or we can take you further into Maasai land to Longido. Most people only use Dar es Salaam as an overnight where needed, but the easily accessible coastline south of the city is worth considering for a few nights by the beach. This small park in western Tanzania is wild, untouched, exclusive and phenomenal. It offers some of the best game viewing in Africa in the dry season. Kilimanjaro, Africa’s highest peak and its little sister, Meru, offer spectacular scenery and a chance for personal challenge. Surrounding Maasai lands offer wildlife with a stunning backdrop. This long thin northern park is dominated by a large shallow soda lake covered with flamingos and other birds. Also home to herds of elephants and tree climbing lions! A highlight of the Rift Valley, this vast, 1.5-million-year-old soda lake - the only breeding ground for East Africa's more than three million Lesser Flamingos. South of Zanzibar are some tiny Indian ocean islands offering a very different kind of experience. Great diving, far fewer people, unusual accommodation like treehouses ”¦ a real escape. The focus of both Mahale and Gombe on Lake Tanganyika are chimpanzees. Gombe was Jane Goodall’s base, and the pricier Mahale can offer quirky luxury. The Udzungwas are a little-known but important area of remote forest and mountains northwest of Selous, great for birding, hiking and primates. Mikumi is a reserve just 4 hours drive from Dar. This area is dominated by the vast volcanic Ngorongoro Crater. See a fantastic amount of wildlife and explore the diverse and scenic highland habitat, where the Maasai still live a traditional lifestyle. This is a smaller, quieter island neighbour to Zanzibar. It’s more rural and whilst the beaches are not quite as good, the diving is superb and there are a couple of great lodges. 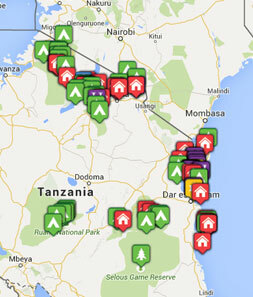 Tanzania’s largest park has only 9 lodges so expect real exclusivity on your safari. Scenic Ruaha is notable for excellent predator sightings; lions, leopards, cheetahs - and vast numbers of elephants. Saadani is a little-visited park north of Dar. It is unusual in that it’s a coastal wildlife reserve. And just north of here you can chill out in a comfy beach hotel near Pangani. The second largest game reserve in Tanzania yet much quieter than the northern parks, with tremendous game viewing. Large numbers of giraffes, wild dogs, big herds of buffalo, elephants and predators. Home to the incredible wildlife spectacle of the world’s largest migration, the Serengeti is an iconic safari destination. Superb for big cats, but also a vast range of other species. Enjoy a quieter safari in the lesser known northern park of Tarangire. Noted for large herds of elephants especially in the dry season when they’re attracted by the permanent river. The main island of the Zanzibar archipelago is called Unguja, but is usually referred to simply as Zanzibar!